This was the scene on Monday evening at 7:20pm in Gresham Street in the City business district. There were about eight cabs on this block servicing the Governor Phillip Tower on Bent Street which houses the NSW Treasury Corporation and a host of banking, legal and financial offices. As it was nice and quiet, not impeding traffic, I was texting my brother when disturbed by a tap on the window. A City Council parking ranger ordered me to move as it was a bus staging zone, despite it being after peak hours. 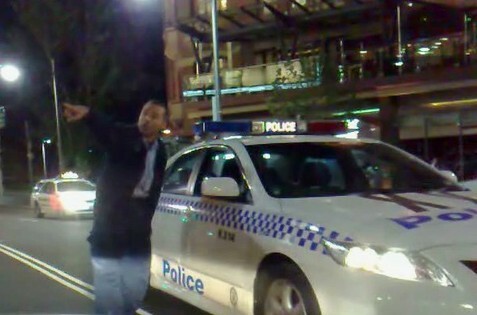 His mate, a female officer was recording my taxi number. I'm not normally quick-tempered but sometimes, gees...know what I mean? At right is (rough) video montage of Monday night's shift including footage of the scene above, some local haunts and vision of the Careflight chopper involved with this story. "Officer, there's a UFO over Hugo's!" Ever wondered about those bleary-eyed clubbers one sometimes encounters when travelling to work on a Monday morning? Whilst most readers were sleeping this morning, Kings Cross at 3am was jumpin'. Local favourites Sneaky Sound System's UFO features in one example of a club scene. Wonder no more, have a nice day. The evocative term, 'white trash' has reared it’s ugly head in the press this past week. That it was used to describe support staff for indigenous communities was somewhat bemusing to anyone familiar with real white trash. The following is an example. During my recent train journey to Queanbeyan I had occasion to witness such a specimen at close quarters. A few hours into the trip a father and daughter boarded and made their way to a booked seat, opposite my own and one forward. This gave me a direct view of their situation, even via the reflections on my window. The girl was around seven or eight years old and lugging a small backpack. She was reasonably well dressed in clean jeans and a sweat top, with long, straight hair tied in a pony tail. Early this morning I collected three students from Central Railway headed to Revesby. They were Year 12 students returning home from their end of year formal celebrations. After missing the last train they requested I take the M5 Motorway. However the dreaded M5 East tunnel was closed for...whatever it is they continually close the bloody thing for...necessitating a detour through Kyeemagh, Bexley and Beverly Hills, before rejoining the freeway at King Georges road. When one is expecting a high speed, uninterrupted run to south-west Sydney this is especially frustrating. Fortunately there was no traffic otherwise my weary passengers would have been understandably peeved. Office workers encountering this constant M5 East closure late at night really seethe over the detour. So just for the exercise I've decided to calculate the extra distance. The affected freeway section measures 9 kilometres with an average speed of 90 kph. The detour route through the suburbs measures 11.3 kilometres for an average speed around 50kph and approximately 20 sets of traffic lights. Grrrr. Another factor, however, is that my taxi network don't issue general broadcasts warning the tunnel is closed for the evening. If so, I could have taken a direct route to Revesby via Canterbury Road...the same route taken by Mark Latham's cabbie! UPDATE: M5 East one of the most polluted road tunnels in the world. Some blokes are pretty basic animals. Just add lots of alcohol, make an appealing suggestion and one can confidently predict how they behave. Early on Wednesday evening I was hailed by two blokes in the southern suburbs who had just alighted from a tour bus. First they requested I wait whilst they finished smoking with a group of business mates, all pretty hammered after attending the annual Bong Bong races. Bong Bong is a legendary picnic race meeting in the Southern Highlands where even losers have fun. These fellas had won handsomely so they were especially high. Therefore, instead of heading into the City they decided on a North Shore hotel with a ‘magic’ brothel next door, turning a twenty dollar fare into a fifty dollar fare. Sweeeet! After recent requests from readers I intend compling a list of proposed improvements to the taxi industry, from a driver's perspective. Or if readers, passengers and drivers alike, have any suggestions please send them to the above email link and I'll include them in the post. UPDATE: Post now planned for early December. A current brouha in England involves a BBC presenter who, whilst playing music on-air, called a Bristol taxi company to book a cab for her 14 year old daughter. Sam Mason, 40 told the operator not to send an Asian driver. “A guy with a turban on is going to freak her out.” The company duly contacted the press and Mason was sacked. Phone recording, story and comments here. An old friend called last week with a taxi tale of woe. Due to a work injury relegating her to a sickness pension, life is a daily struggle and money is always short. So when her companion cat of fifteen years fell seriously ill, a vet friend agreed to treat the pet for free. Fair enough, too, as getting to his surgery required a $100 taxi fare. 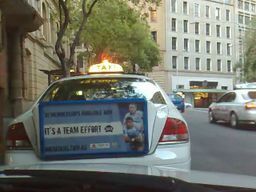 This resulted in a verbal dispute and, I believe, both parties have since lodged complaints to the taxi network. UPDATE: SMS received yesterday: "Elvis is in cat heaven." UPDATE 2: The French/Egyptian feline mourning period of one week is currently being observed as Elvis lies in state...in the freezer.